KEY FEATURES: Deciduous tree to 20m. LEAVES terminal clusters, opposite, compound, digitate. LEAFLETS 5-7, oval, to 12x6cm, grey-green, furry, edge toothed, tip sharp. 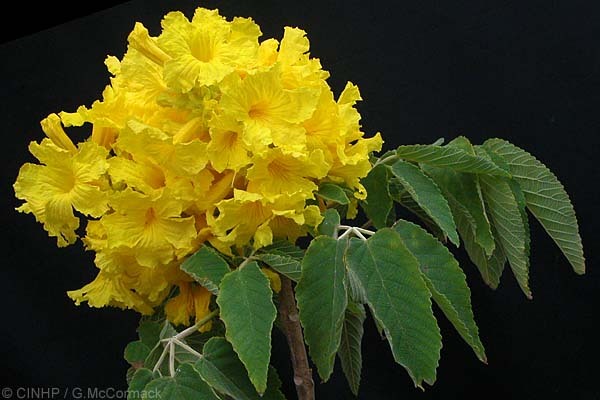 FLOWERS many in dense erect clusters, to 20cm high; bell-shaped with 5 round lobes, yellow; calyx yellow, to 1cm. FRUIT narrow cylinder to 25cm. SIMILAR SPECIES: See under Silver Tabebuia (Tabebuia aurea).